Dr. Brenda Haven has over 30 years of aeronautical systems acquisition, research and development, and teaching experience, much of it within the area of gas turbine engines. She retired from the Air Force as a Lieutenant Colonel in 2008 after serving as the Deputy Director for the Physics and Electronics Directorate at the Air Force Office of Scientific Research. During her 25-year career, she spent 5 years working in the Turbine Engine Division within the Propulsion Directorate at Wright-Patterson AFB and another 8 years teaching thermodynamics and propulsion in the Air Force Academy’s Department of Aeronautics. While at the Air Force Academy, she served as the Propulsion Discipline Director and Deputy Department Head. She was named the Outstanding Military Educator in 1993 and served for three years as an adjunct faculty to the Air Force Test Pilot School. After retiring from the Air Force, Brenda joined Embry-Riddle Aeronautical University. 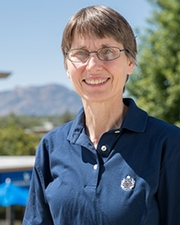 She is one of two faculty teaching the propulsion track of the Mechanical Engineering Program. She teaches thermodynamics, fluid mechanics, and three propulsion courses, including Propulsion Systems Preliminary Design. She was awarded the College of Engineering’s Outstanding Teacher Award and Outstanding Contributor Award. She has also received the campus Distinguished Faculty Award and the President’s Special Recognition for Excellence for her exemplary service to Embry-Riddle Aeronautical University.